There is one fitness metric that you should track. It’s called Heart rate variability (HRV). HRV provides accurate, up to the minute feedback on how you’re body is doing from a systemic standpoint. It will take the guess work out your training program. Are you fully recovered from your training sessions or are you continuously over training, sacrificing results and possibly setting yourself up for injury? Knowing the answer to these questions, can guide you to successful long term fitness development. If you can minimize the down time and avoid over-training, you’ll have less chance of injury and more results. However if you unknowingly skip on the needed recovery you’ll find yourself constantly over training. It can take days, even weeks to fully recover depending on how far you’ve stressed your system and dug into your reserves. In some cases, it can take an athlete a whole season to fully recover. I’ve seen shin splints linger through out an entire sports season. Never letting up until activity is decreased or stopped completely. So how do you know when your over-training? How do you know when you’re ready to push and go for it? Do you need thousands of dollars of equipment? Or do you have to wait until you get an injury, feel exhausted, or you’re totally unmotivated. You can get an answer to all these questions and stay ahead of the game if you take this one fitness metric. You simply use a heart rate monitor and smart phone to track your heart rate variability first thing in the morning. The data you receive tells you whether you’ve recovered from your previous training session and how to progress from there. If you’ve seen what an EKG read out looks like (the above graph), then you’ve seen HRV. HRV is the time between each heart beat, represented by the distance between each high peak in the graph above. The more variation in between beats the better. It means your body is sensitive enough to respond to the constant push and pulls of the autonomic nervous system, our fight or flight response system. Less variability means your body isn’t responding well. In fact, in some cases like diabetes, there is very little change in heart rate variability signifying your body is not adjusting to the increased level of sugar in the blood. 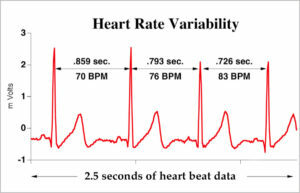 So when it comes to Heart Rate Variability the more variation you have, the more fitness, the more resilience and the more rested you are. 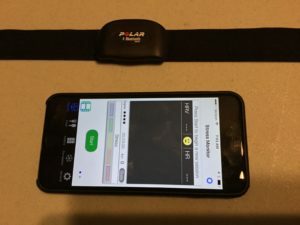 All you need is a Bluetooth Heart Rate Monitor (like this one here), your smartphone and HRV app that you can download from the App Store. When you first wake in the morning, put on your heart rate monitor and start the app. There are several good apps out there and some are even free. It usually only takes a minute or two to get your HRV reading for the day. After you’ve taken your HRV you can compare that number to an already established baseline. If your number is lower than the base line it’s usually recommended to do a lighter workout. Drop two days in a row, then it will suggest that you skip exercise all together and rest. Once your HRV has recovered then you can go back and resume your training as planned. This is personalized training at its best. 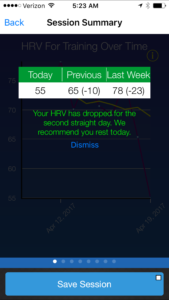 You simply take your HRV and then appropriately plan for the days activity. This simple measurement gives you the reliable information you need to adjust your training program on a day to day basis. It puts the end to all the guess work. It also keeps you ahead of the game. 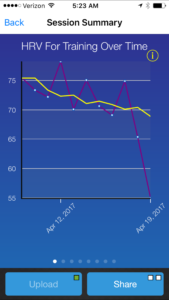 You’ll see a decrease in your HRV days before you’ll feel the physical manifestation of over training. So instead of waiting until you feel unmotivated, exhausted or suffer an injury you’ll know ahead of time to back off from your training until you have fully recovered. This provides you long term sustainability (training with out injury) and better results. You’ll know when to push for high intensity training sessions and when to back off and do more recovery work. Then when you’re fully recovered you can safely push the intensity of your training. If you’re training to lose weight, to hit a personal record, or just to participate in the game of life you’ll need this information. It’s an accurate snapshot of how your body is responding to all the stresses in your life. Adding more exercise when your body is already at its limit is enough to send it into a chronic state of over-training. But if you have the information and data to know that your body is ready for intense training, you can capatalize on that knowledge and push yourself to better results.